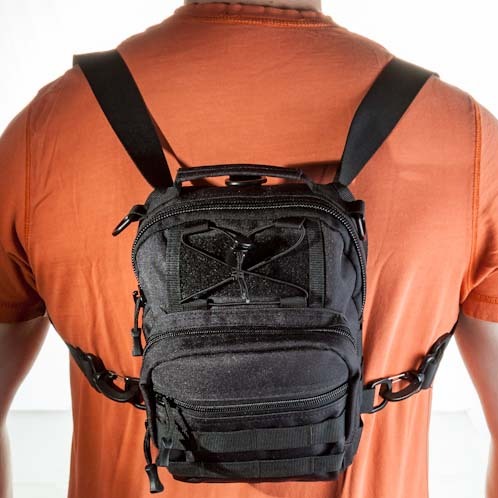 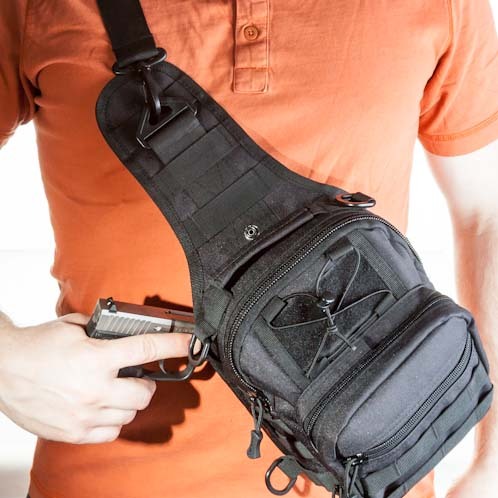 Converts from Bugout Bag backpack to conceal and carry shoulder sling to EDC bag in seconds! Features 9 different pockets in a sturdy nylon design. 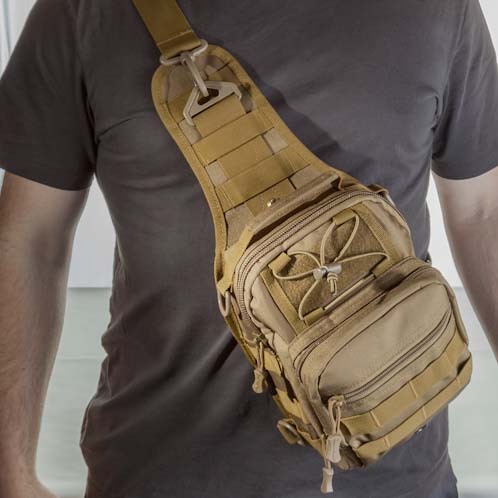 Available in Black or Tan. Converts from Bugout Bag backpack to conceal and carry shoulder sling to EDC bag in seconds! Features 9 different pockets in a sturdy nylon design. 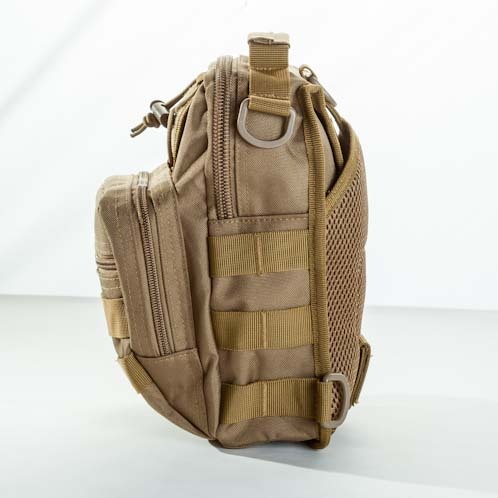 Available in Black or Tan. 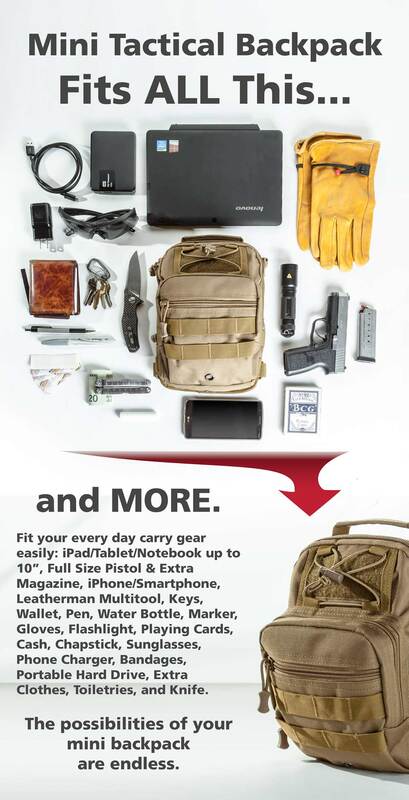 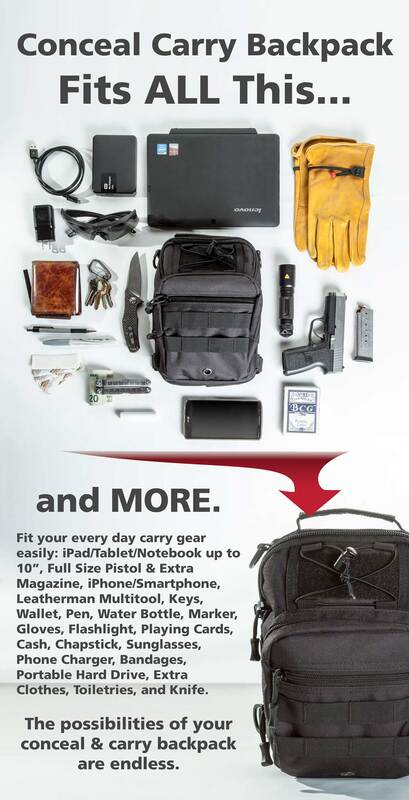 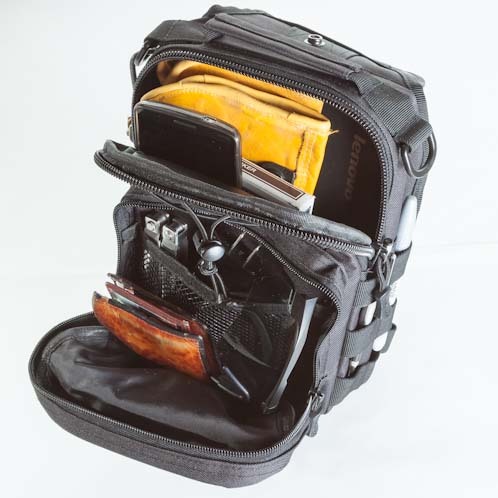 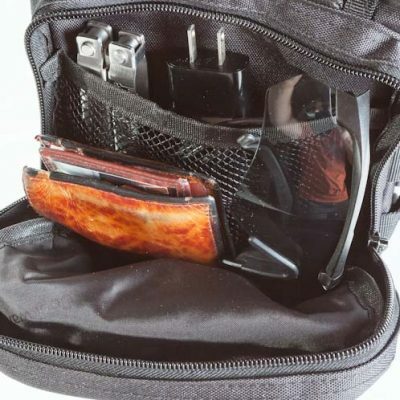 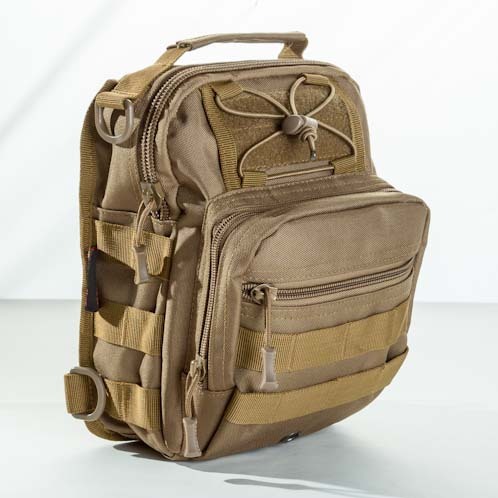 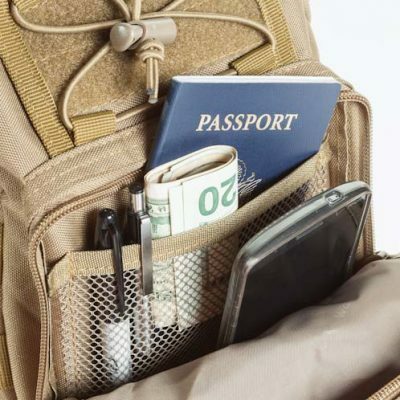 Made to fit a variety of equipment including Knife, Rope, Pistol, Gun Magazine, Wallet, Phone, Smartphone charger, Small tablet up to 9″ x 6.5″, Flashlight, Notebook, Pen, Marker, Leatherman, Keys, Chapstick, Bandaids, Sunglasses, Passport, Flash drive, Cables, Headphones, Cash, Batteries, Gloves, Comb, and MORE. 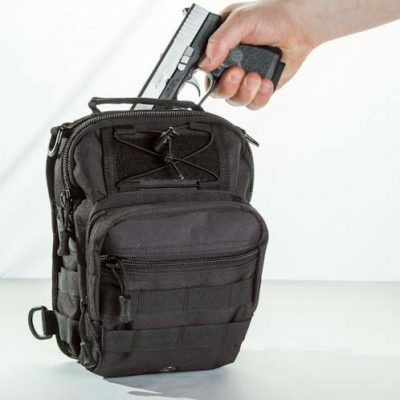 Supports up to 10lbs loaded weight. 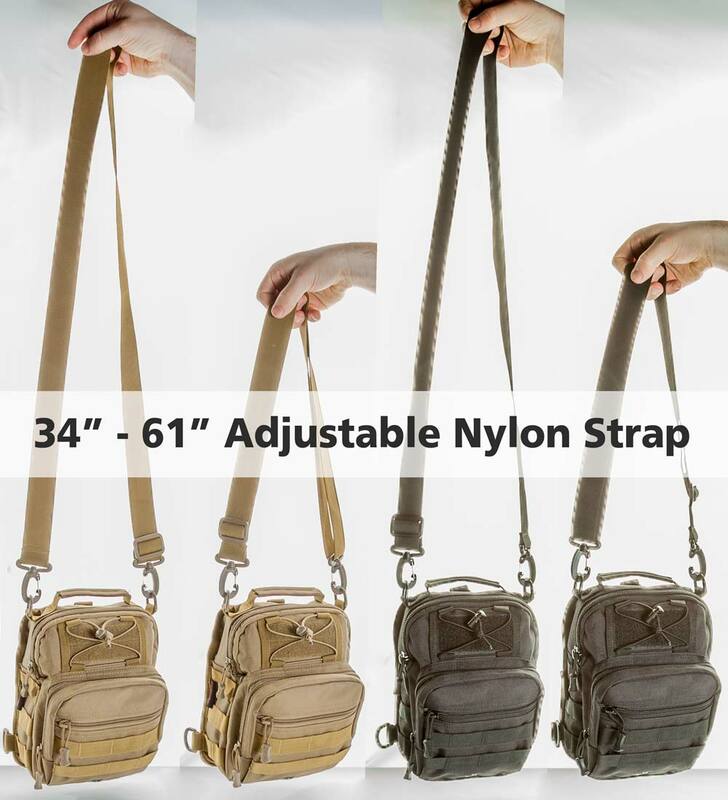 Extra wide and comfortable nylon strap that extends from 34″ to 61″. 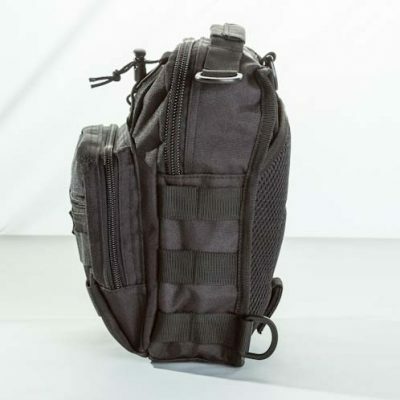 This allows for several different methods of carrying the backpack. The strap can be removed in a matter of seconds in case you prefer to use the carry handle instead. 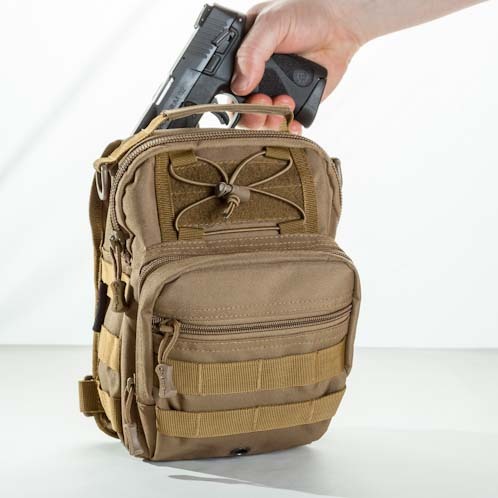 The carrying handle makes it easy to hold the pack without the need for the strap. So if you find it is easier to go without the sling, simply remove the two clips and your bag is ready to go very quickly. 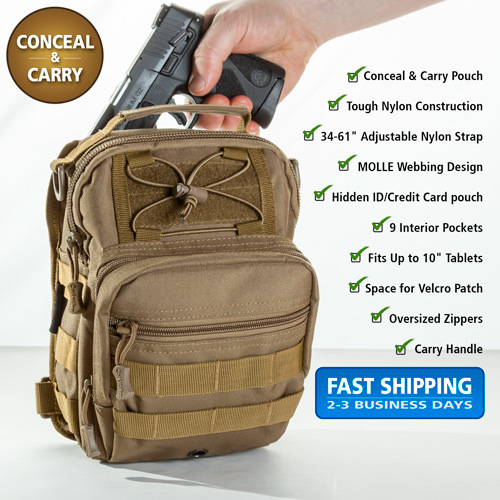 Easily converts from backpack to shoulder sling to bag in seconds! The spring-loaded high density ABS and metal clasps are designed to withstand daily abuse. 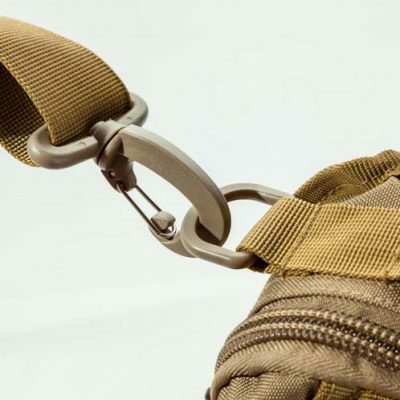 Never be annoyed with the dreaded twisted strap again – these clips feature swivels on both ends. 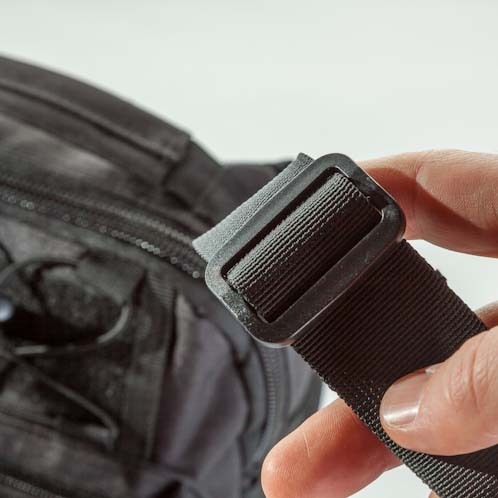 It is very intuitive to adjust the nylon strap with the sling position clips. 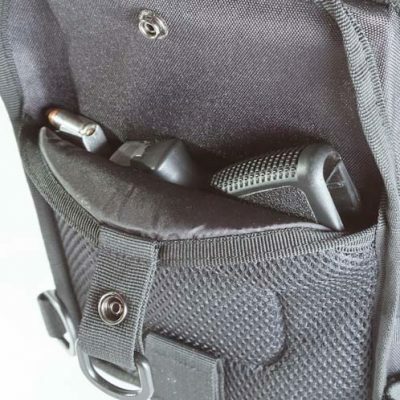 Go from 34″ short to 61″ long by pulling on the strap and holding the clip. 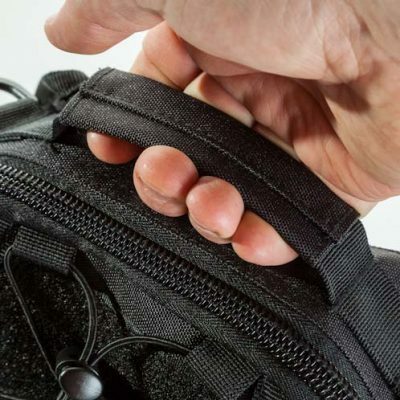 Once in the desired position, the sling adjustment piece will hold its place without issue. 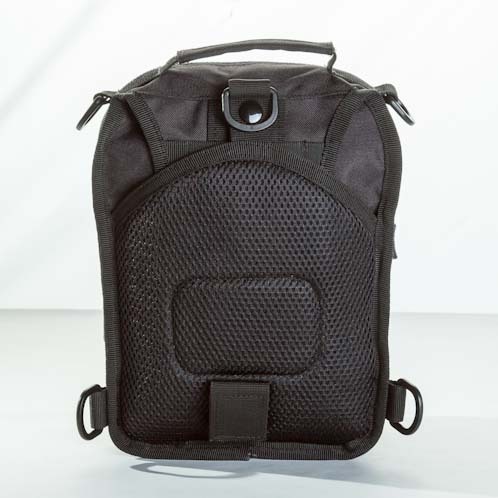 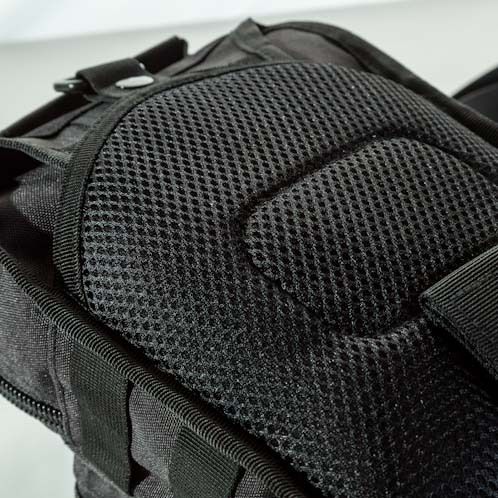 On the back of the pack there is breathable padding mesh to ensure comfortable carrying. 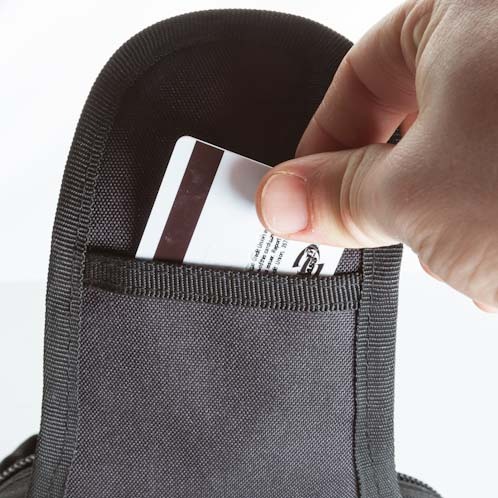 Within the shoulder strap, there is a hidden pocket for storing your ID, Carry Permit, Credit Card, or Cash. 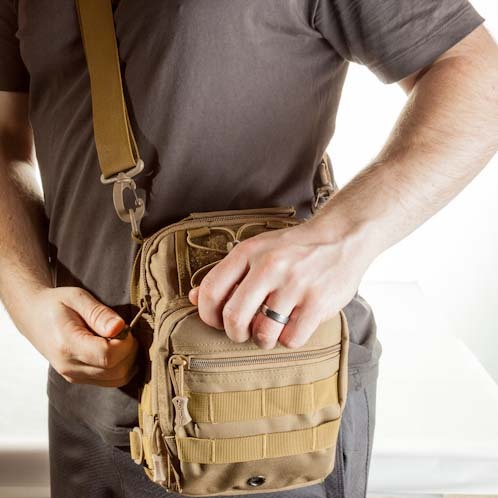 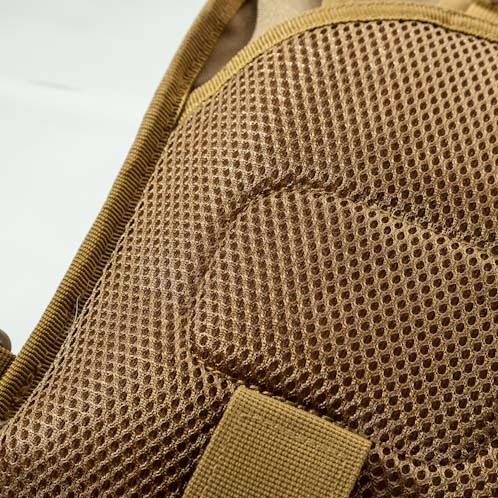 The pocket can be positioned in two ways: Hidden from plain view facing your body, or tucked in with the shoulder strap into the back of the bag.